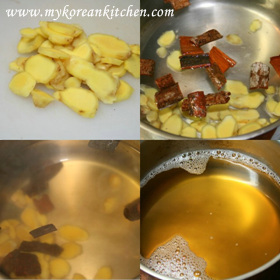 Healthy and soothing Korean ginger tea (Saenggang cha) recipe! A few days ago, my husband was coughing a lot and he said he had a sore throat and mucus. I am not a doctor, but he thinks I can fix him. 🙂 He basically doesn’t trust modern medicine and loves oriental treats so much. 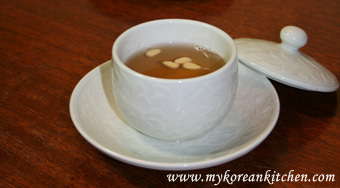 So I made this Korean ginger tea (Saenggang Cha, 생강차) for him. 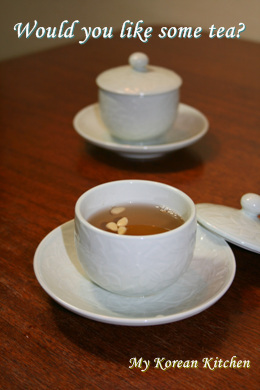 Korean ginger tea has a warm character, so it helps blood circulation and keeps your hands and feet warm. It also helps stop coughing and clears mucus. 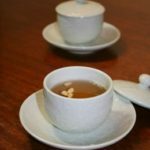 Though oriental doctors recommend not to drink it if you have a fever. Put the ginger, cinnamon, and water into a pot. Boil it on medium to medium low heat for about 25-30 minutes. Above ingredients give me more than 1.5 L of tea. And, this is how I keep the rest. My husband just reheats a little amount of tea whenever he drinks it – 2 times a day. I used this when I was really nauseated and it helped a ton. However the ginger can be really strong I mixed in about 1/2 cup to 1 cup of honey to sweeten the whole batch and then refrigerated it. Hope this helps and I hope you feel better. Hi I was given some korean red insam bean jelly. Actually quit alot of it. Can you tell what it is good for and how to prepare it? Can I make a hot drink or just eat it? Please help me I want to use it, but not sure how and what it’s purpose is. You can just eat the jelly as it is. No cooking is required. 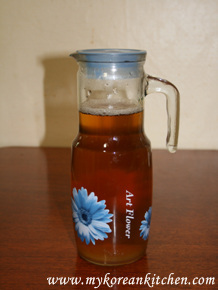 I am interested in finding this tea in a pre mixed version since I am not very good at making this kind of thing and itb sounds like something bthat might help my throat. Is there a mail order or something like that? i live in Vernon , Connecticut , USA . 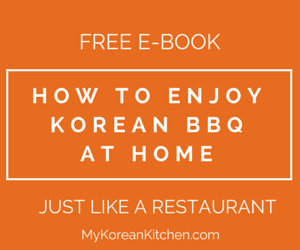 I like Korean Food but am not aware of anything Korean in this area. I think you meant “Gyepicha”. Gyepi is the cinnamon. 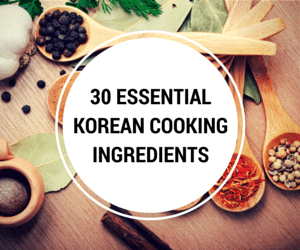 Have you tried a Korean grocery shop yet? 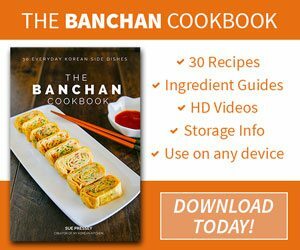 I tried online Korean grocery shops based in the US, but I couldn’t find it. persimmon, i thought somone said its called ‘pi cha’ [pi tea] but there is no tea just cinnamon. does anyone know where it can be bought in america or canada ? My husband and I visited Australia recently, and would you believe it, we forgot to bring back any of the spices we had meant to get. No worries though, like you said, I can get most of them here anyway. That’s right, I use cinnamon bark, not ground cinnamon. I always use the freshest or more natural ingredient if possible. I’m interested in the “fresh cinnamon” part. Does this just mean cinnamon bark versus ground cinnamon? When I was packing, I didn’t know what would and wouldn’t be available. Since I’m a food nerd, I packed herbs and spices just in case I couldn’t find them here. 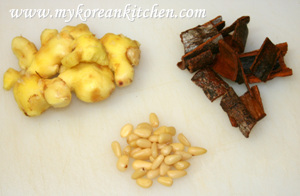 I have since found in Korean stores most of what I packed except cloves, allspice, and Texas chili powder. Oh, and Old Bay Seasoning–which is a form of currency for foreigners from the Gulf Coast. How did you think to bring cinnamon to Korea from the US, that was good planning. I hope you make some good ginger tea. this tea sounds really soothing for a sore throat and that is a LOT of cinnamon you got! I love 생강차! Great tea for the holidays. And, yeah, I brought a small package of stick cinnamon with me from America when I first came here almost three years ago. I still haven’t used it all. Yet it’s good to know I can find it fairly easily at the big box supercenters.